PROVIDING A MUCH-NEEDED RAILROAD CONNECTION: In 1892, Oliver W. Barnes, an engineer associated with Pennsylvania Railroad president Alexander J. Cassatt and bridge designer Gustav Lindenthal, conceived plans for the Hell Gate Bridge. Cassatt saw the Hell Gate project - originally called the "East River Arch Bridge" - as an opportunity to bring rail traffic from Pennsylvania Railroad routes in New Jersey and points west through New York City to New England. The project was to also tie into the Long Island Rail Road routes, in which the Pennsylvania Railroad had a controlling interest. Meanwhile, Lindenthal saw the Hell Gate project as his chance to construct his Hudson River Bridge, a suspension bridge with a 2,800-foot-long main span that would have been the longest in the world. That same year, the New York Connecting Railroad was incorporated to help realize this plan. In 1904, Lindenthal, who oversaw the opening of the Williamsburg Bridge and the construction of the ongoing Manhattan Bridge and Queensboro Bridge projects, was chosen as consulting engineer and bridge architect by the Pennsylvania Railroad, which had just acquired the New York Connecting Railroad. Under these auspices, Lindenthal was engaged in a project to connect the tracks of the Pennsylvania Railroad in New Jersey, the Long Island Rail Road in Queens, and the New York, New Haven and Hartford Railroad in the Bronx. Although the project allowed Lindenthal to design the Hell Gate span, it would not include his long-sought goal: a great suspension bridge across the Hudson River. Instead, the Pennsylvania Railroad decided to use exclusive tunnels for rail traffic across the Hudson and East rivers. Highlighting this project was the Hell Gate span crossing the Hell Gate (roughly translated as "beautiful strait" in Dutch), a portion of the East River with treacherous currents separating Queens from Ward's Island, an island that was used for a large state mental hospital. The steel-arch span, which measures 1,017 feet, six inches long, was the longest span of its type in the world when it opened. The four concrete towers that serve as portals to the arch bridge are 250 feet high. The viaduct sections are supported by arched concrete supports. From end to end, the bridge measures 16,900 feet long. Prior to the selection of the current design, three competing designs for a bridge with an 850-foot main span over the Hell Gate were considered: a stiffened suspension bridge with eyebar chains, a three-span continuous truss bridge, and a three-span cantilever bridge. None of these alternatives were selected, not only because of the concerns posed by the dynamic loading of heavy railroad trains, but also because of the tight curve that was necessary to avoid the state hospital buildings on Ward's Island. The approved design provided the high clearance required for navigation across the Hell Gate, but did not require the long, straight approaches of the other alternatives. Although its foundations would be more costly, the steel arch design was cost-competitive because it required less steel than the other alternatives. BUILDING THE HELL GATE COMPLEX: Lindenthal employed a staff of 95 engineers to calculate how the weight of the trains would be borne by various parts of the bridge, how individual steel members would be made and joined, how much masonry would be required, and how the different functions of bridge construction (for example, the location of bridge abutments vis-à-vis the alignment of the steelwork) would be coordinated. With other engineers performing the calculations, Lindenthal concentrated on the aesthetics of the bridge. By 1905, two competing steel arch designs were evaluated for the Hell Gate span. The first design, a "crescent arch" where the upper and lower chords of the arch meet at the anchorages of the bridge, copied the design of Alexandre-Gustave Eiffel's Garabit Viaduct in France. This design was assailed because it appeared weak in comparison to the great height at the center of the arch. Another design, a flatter "spandrel arch," had the lower chord begin at the bottom of the anchorages, while the upper chord began at the top of the anchorages. The latter design, which was inspired by similarly designed bridges over the Rhine River in Germany, appeared more rigid, and was ultimately chosen for the Hell Gate Bridge. 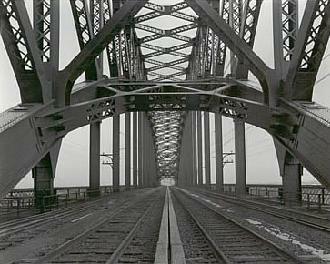 The Hell Gate Bridge used more steel than the Manhattan and Queensboro bridges combined. The chords were made of a recently developed material - carbon steel - that gave greater strength for its weight. The heaviest bottom chord sections weighed 185 tons. All of this steel was necessary to handle the heavy rail traffic of the day: the bridge was capable of carrying 60 locomotives at a single time. Lindenthal also played a role in the design of the tower piers, the caissons for which had to be sunk to a depth of 90 feet to reach solid rock. He adopted the initial tower design submitted in 1906 by consulting architect Henry Hornbostel, but with modifications. The original design left a gap of 15 feet between the beginning of the steel arch and the masonry towers. Fearing that the public assumed that the towers support the bridge, Lindenthal added girders between the upper chord of the arch and the towers so that they would appear connected. The girders did not have any engineering significance, but they added to the architectural beauty of the bridge. Construction of the Hell Gate project began in 1912, two years after the first trains traveled under the Hudson River tunnels to Pennsylvania Station in Manhattan. With construction well underway by 1914, another change was made, this time to the viaducts leading to the Hell Gate span. The original 1907 plan called for steel girders and steel piers to be used, since Lindenthal believed that locally soft ground conditions, and the underground network of sewers and utility lines would not support an all-concrete viaduct. Concerns that inmates at the state institutions on Ward's and Randall's islands would climb the steel piers for their escape forced Lindenthal to use concrete for the viaduct piers instead. The steel girders would be kept, but to deaden of sound of passing trains, the rails would be embedded by 14 inches of broken-stone ballast, encased in concrete. Toward the end of 1915, the two trajectories of the steel arches from the Astoria and Ward's Island anchorages met high above the Hell Gate. The arch bridge, the two smaller bridges and the viaduct were completed in September 1916. On March 9, 1917, the first Pennsylvania Railroad train - the Federal Express service between Washington and Boston - went over the Hell Gate Bridge, completing the first uninterrupted rail service between the two cities. DOUBLE-DECKING THE HELL GATE? In the 1920's, when the City of New York proposed the Triborough Bridge to connect Manhattan, Queens and the Bronx, Lindenthal, who did not want to spoil the view of his Hell Gate Bridge, devised an alternative design. Instead of constructing what he called a "suspension bridge of cheap pole and washline architecture," Lindenthal suggested adding a second deck to his Hell Gate railroad bridge to carry five lanes of automobile traffic. The alternative plan also called for two spurs: one to East 102nd Street to provide direct access to Central Park, and another at East 116th Street. While he did not immediately call for a spur at East 125th Street - he believed that the area was already too congested - one was planned for construction at a later date. 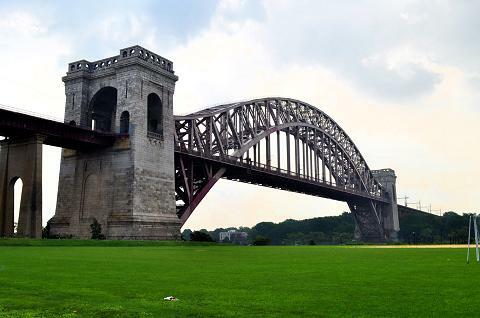 THE HELL GATE BRIDGE TODAY: The Hell Gate Bridge, which today has the 17th longest main steel arch span in the world, continues to play a central role in rail transportation in the Northeast. Only three of the four tracks are used on the bridge. The two south tracks carry Amtrak Northeast Corridor trains, while the north inner track carries CSX and Norfolk Southern (the owners of the former Conrail routes) freight trains. The north outer track is no longer in operation. In the late 1980s and early 1990s, Senator Daniel Patrick Moynihan, who spent his childhood near the bridge in Astoria, lobbied to have the Hell Gate Bridge refurbished. Although the nearby Triborough Bridge was being maintained and repainted constantly, the Hell Gate Bridge had not been painted since it opened in 1916 except by the skillful hands of graffiti artists. Since the bridge was deemed structurally sound by Amtrak president W. Graham Claytor, Jr., he saw little need for spending money for "cosmetic purposes." Buttressed by a 1991 article in The New Yorker on what Moynihan called "a great engineering miracle," Congress appropriated $55 million to repair and refurbish the Hell Gate Bridge. A unique color was even selected for the bridge paint: "Hell Gate Red." The restoration project was completed in 1996. In 2008, Amtrak began a $10 million project to refurbish the concrete viaducts on both sides of the main arch span. The project, which was delayed by two years and cost reviews (it originally had been estimated to cost $3 million), seeks to remedy water leaks and falling concrete that had endangered pedestrians and damaged vehicles underneath the viaducts. A new coat of paint will be applied to the main arch span under a separate contract at a future date. SOURCES: The Bridges of New York by Sharon Reier, Quadrant Press (1977); Great American Bridges and Dams by Donald C. Jackson, Preservation Press-John Wiley and Sons (1988); Engineers of Dreams by Henry Petroski, Vintage Books-Random House (1995); "A Guide to Civil Engineering Projects in and Around New York City," American Society of Civil Engineers (1997); Bridges by Judith Dupre, Black Dog And Leventhal Publishers (1997); "Long Overdue Hell Gate Bridge Repairs Getting Underway" by John Toscano, The Queens Gazette (3/26/2008); Dave Frieder; Thomas Scannello; Christof Spieler; Stéphane Theroux.